I have been so busy with work recently that my free time has been limited. I have tried to squeeze in some crafting where I can but I have had to do things a little differently in order to make sure I could complete some cards. 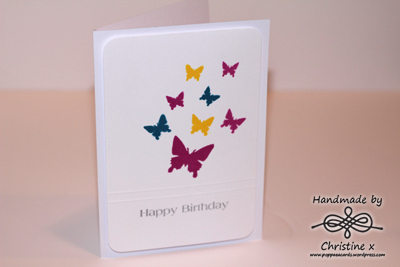 For this first card I used Memento inks and the butterfly stamps from Kanban’s Spring Time stamp set. 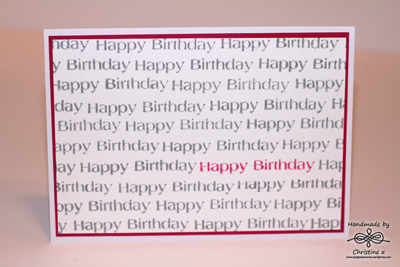 For extra detailing on this very simple card I embossed a couple of lines and then rounded the corner of the matt. This took minutes and could be really easily recreated using different colours for a different look. This card was even easier! Just one stamp repeatedly stamped across the page in Memento ink. I drew faint lines in pencil to make sure the images were lined up (it’s not perfect so don’t look too closely!). In order to get the matt to match the highlight colour exactly I applied the ink direct to card. This card took a little longer to make but I love the simplicity of it.